Recently, there have been a number of news articles pointing out that the next property assessment will include a significant increase. This is true. However, this will not lead to a commensurate increase in property taxes. This notion is predicated on a misunderstanding of municipal finance. This article explains the situation, and why homeowners across BC and in the Greater Vancouver Area, specifically, don’t need to worry. Where Does the Belief Come From? Average home prices are rising steadily across most of British Columbia, thanks to a nation leading economy and low interest rates. Nowhere is this issue more acute than in the Greater Vancouver area, where the average resale price has gone up by 14% since September of last year, driven primarily by single-detached homes. 2016 notice of assessments will be mailed in January 2016, using evaluation dates of July 2015. Since the previous evaluation, resale prices have risen significantly and BC Assessment expects “some of the highest increases we [..] have seen in the last 10 years”. Some have taken this coming increase in assessed value to mean a pending increase in property taxes. This is not the case (to be fair, some articles do point this out, but not all). 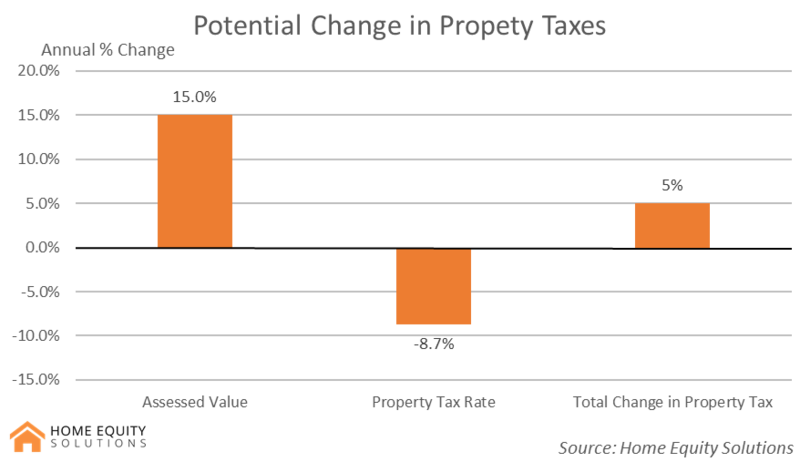 At a given property tax rate, an increase in assessed value would lead to an increase in annual property taxes. However, that is not how municipal finance works in Canada. We will explain below, but the long and short of it is that you should not expect a significant increase in your property tax bill next year. What Will Actually Happen and How the Heck Do We Know? First of all, no need for the language. Second of all, great question. The key thing to understand here is that municipalities in Canada are legally obligated to operate using balanced operating budgets (they are, howeverm allowed to borrow for the purposes of capital expenditures). When they are planning their operating budget for the following year, they estimate the cost of garbage pickup, library operations, administrative tasks, police services, etc. They then set their fees and tax rates so that their estimated revenue equals their estimated costs. So, if the average assessed value rises 15% next year, but operating costs only rise by a few percentage points, then property tax rates will be lowered so that their expected revenue does not exceed their expected costs, resulting in a net modest increase in property taxes. Because housing prices are so high in Vancouver, property tax rates are very low - far lower than the rest of the country. So there is no need to worry. Your property taxes will not be going up dramatically as a result of your higher property tax assessment.